Park Yoo-chun, actor and member of boy band JYJ, was questioned by police over allegations of drug use. He presented himself at the drug crime unit of the Gyeonggi Nambu Provincial Police Agency in Suwon, south of Seoul, at around 10 a.m. on Wednesday. Upon arriving, Park told reporters he would faithfully undergo investigation. 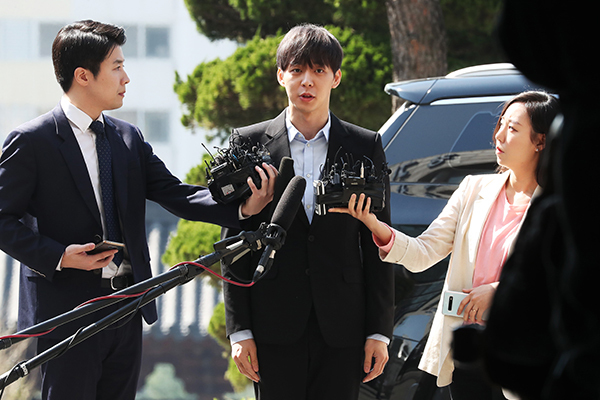 The 32-year-old singer is suspected of taking drugs along with Hwang Ha-na, the granddaughter of the founder of Namyang Dairy Products. He is alleged to have used methamphetamine earlier this year with Hwang at her residence in Seoul. Police raided Park's house on Tuesday. They confiscated his mobile phone and other belongings and collected hair samples for drug tests.